As an international first aid charity, we’re proud to help other EMS and First Aid groups. Part of our charitable goal and aim is to always help other first aid charities and organizations within the nerd and pop culture community with similar values. In honor of National EMS Week 2018, we have decided to help The Usagi Medical Group. They are a fantastic organization from the Atlanta and southeast area. Founded by Laura Block, their core mission is to assist various conventions and events in staffing their first aid departments. They have been assisting numerous conventions within the anime community with first aid staffing and management since 1997. 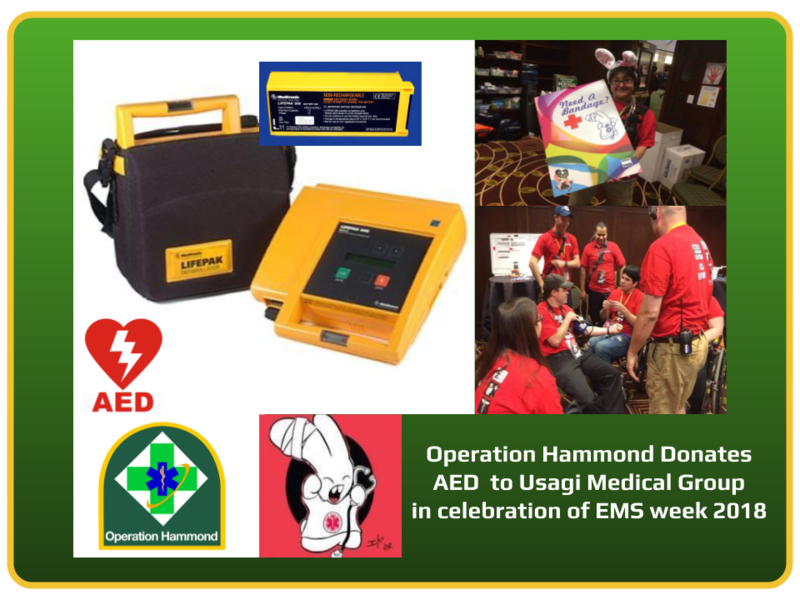 EMS Week 2018 is a special time for us and in honor of it, Operation Hammond is proud to announce the donation of a Lifepak 500 AED to the Usagi Medical Group. The Lifepak 500 AED is tried, tested and used by countless EMS agencies and hospitals across the world. It includes all mission critical features necessary to provide industry standard treatment for Sudden Cardiac Arrest and CPR. 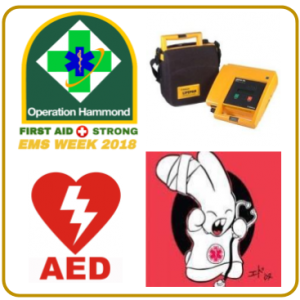 At Operation Hammond, we firmly believe that AEDs save lives and every organization that provides First Aid services should own one due to their proven ability to save lives. Since our inception, we have advocated and donated many AEDs to organizations across the world. It is our honor and privilege to gift an AED to the members and leadership of Usagi Medical Group in honor of EMS week. Operation Hammond is an international non-profit organization of like-minded individuals within the anime, sci-fi, fantasy, and pop culture convention community dedicated to bringing awareness of first aid, emergency preparedness and training to people who attend and staff anime, sci-fi, fantasy, and pop culture conventions. The diversity and social dimensions of this social scene are unique. We are nerds helping nerds in times of need. Operation Hammond is headquartered in Methuen, MA with offices in Manchester, NH and Ottawa ON, Canada.